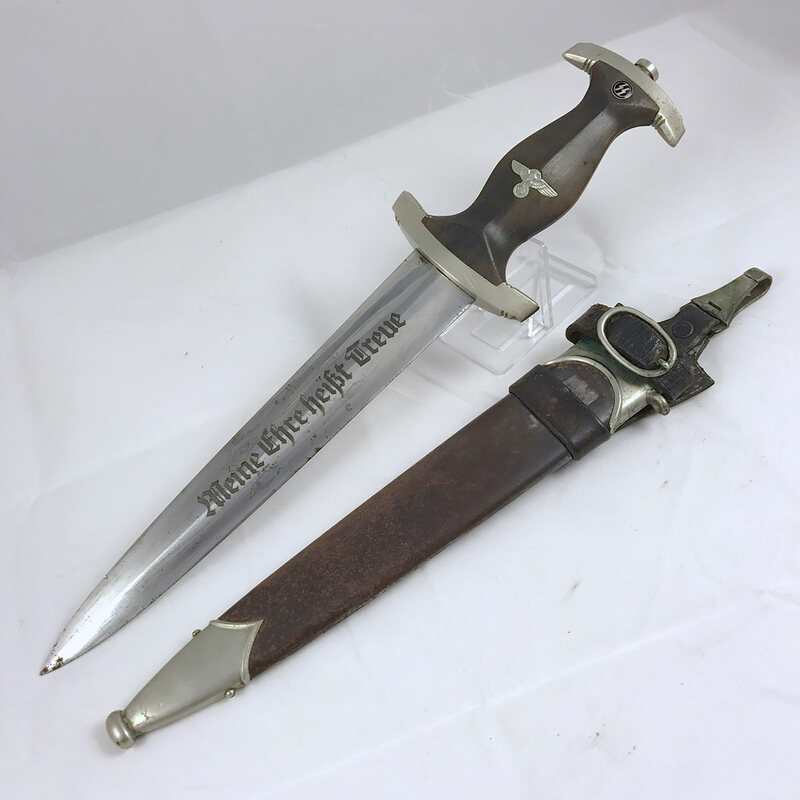 Here’s one for the die hard Boker SS Dagger fan. Another example never before offered to the public. 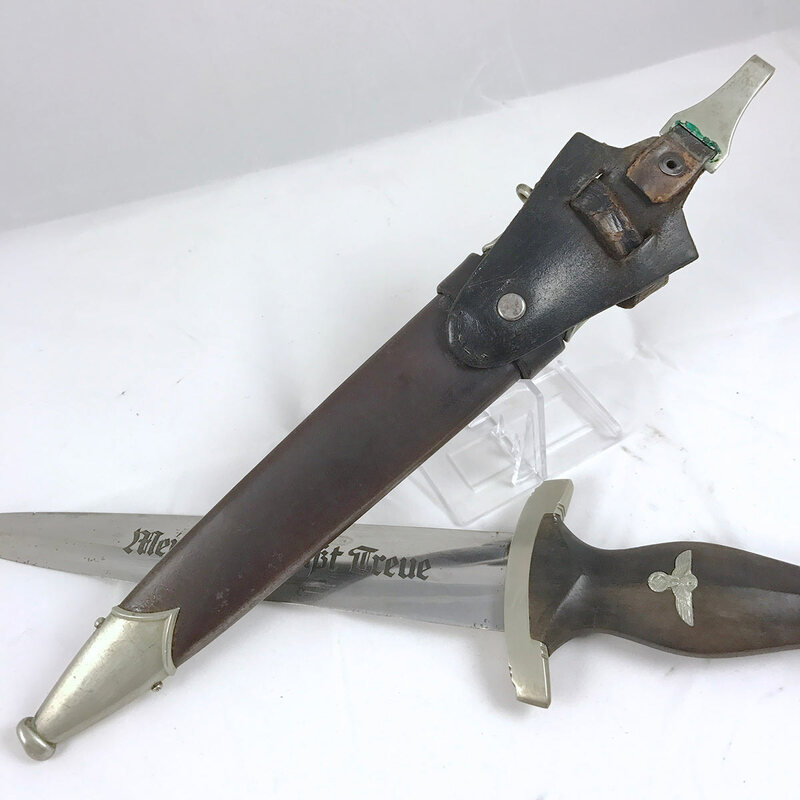 This dagger was recently purchased from a relative of the WW2 veteran who liberated it during the war, and has been packed away for decades! The grip is a nice even black tone that almost perfectly matches the color of the scabbard. Aside from a few normal dings and scratches from use, and from the vertical hanger clip on the reverse, there is no notable damage. 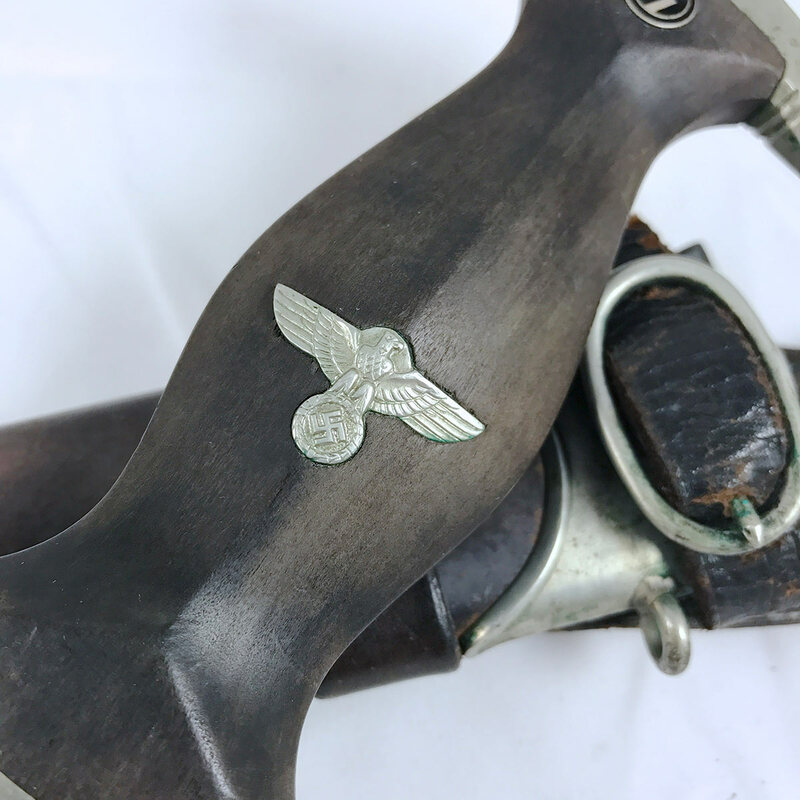 The nickel eagle shows nearly 100% of it’s original factory detail. 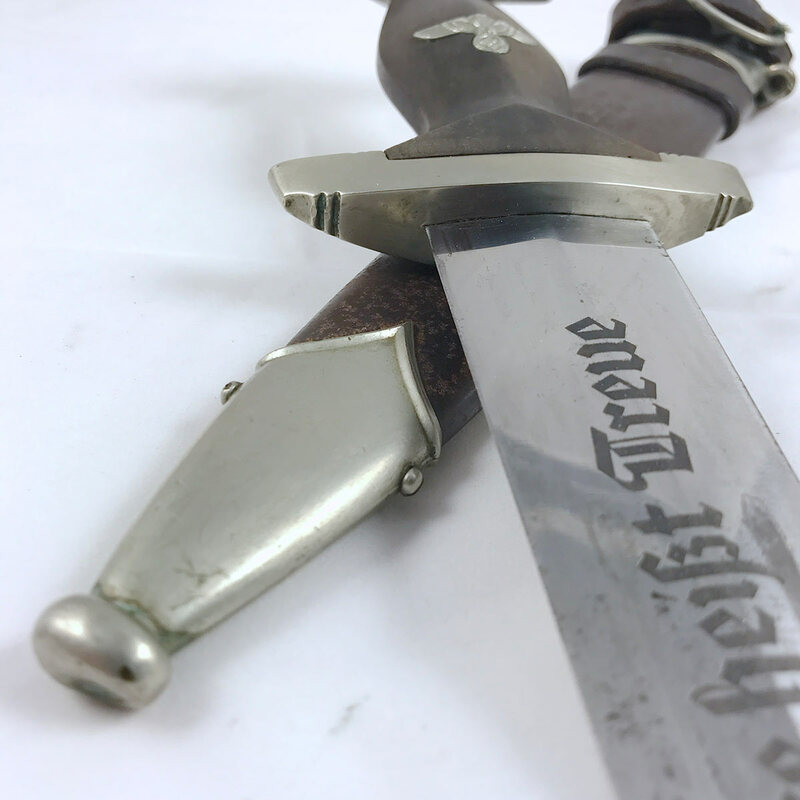 The SS roundel shows no damage to the enamel and is as preserved as the eagle – absolutely remarkable! 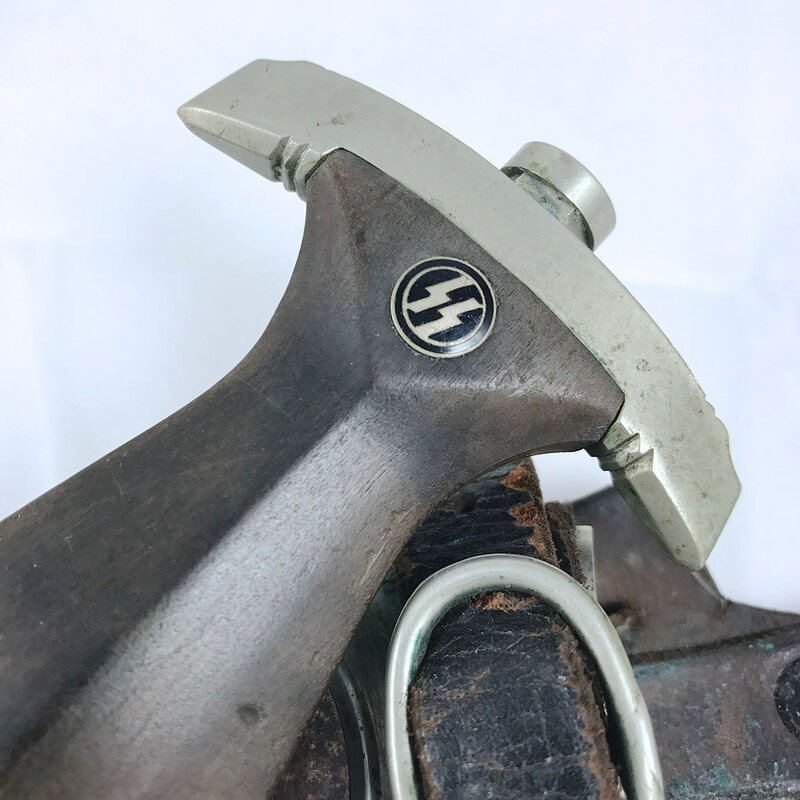 The pommel not shows no signs of having ever been removed; no plier marks or swirl marks. 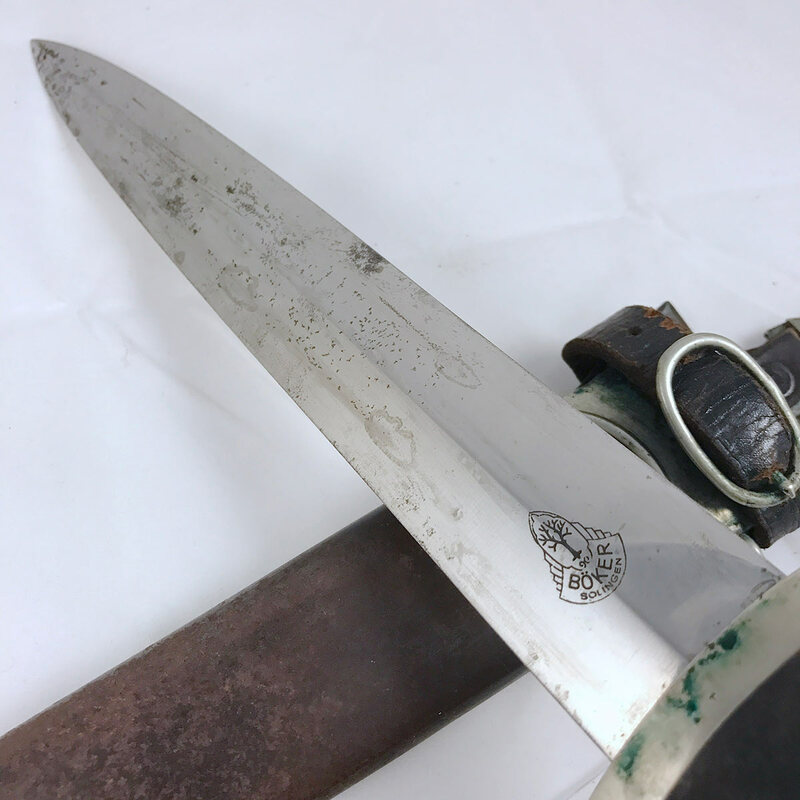 Both upper and lower guards are still dirty, with the reverse of the lower guard showing green verdigris buildup where the nickel was in direct contact with the leather of the vertical hanger for so many years. This is perfectly normal and is NOT damage. 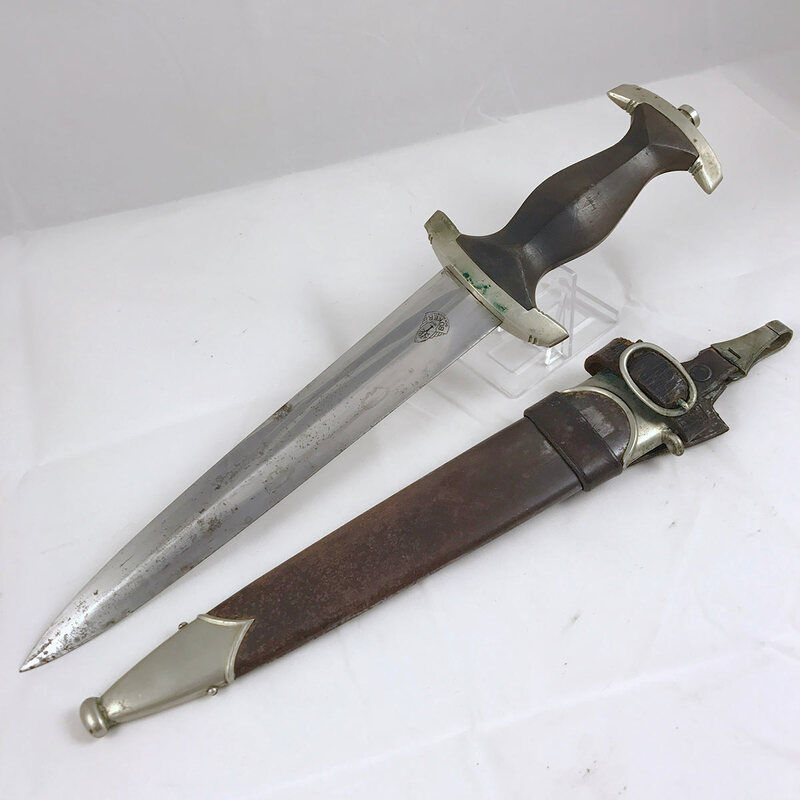 We do not clean or polish our daggers, we leave that option up to the buyer as most collectors like their daggers to remain as they were when uncovered. 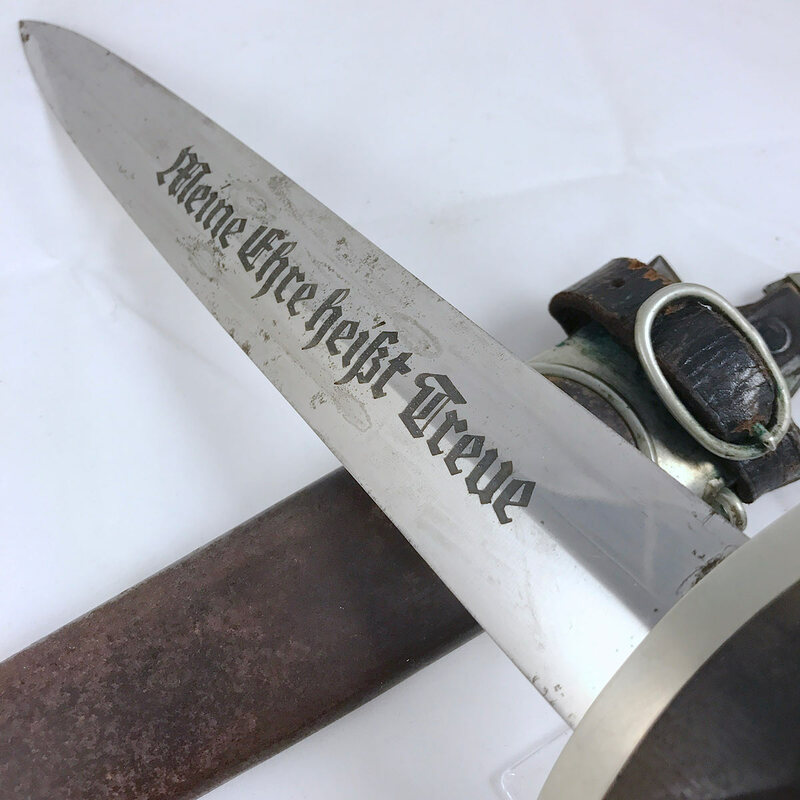 The blade shows the typical signs of age that we tend to see with these daggers when they’ve been stored for decades inside the scabbard. 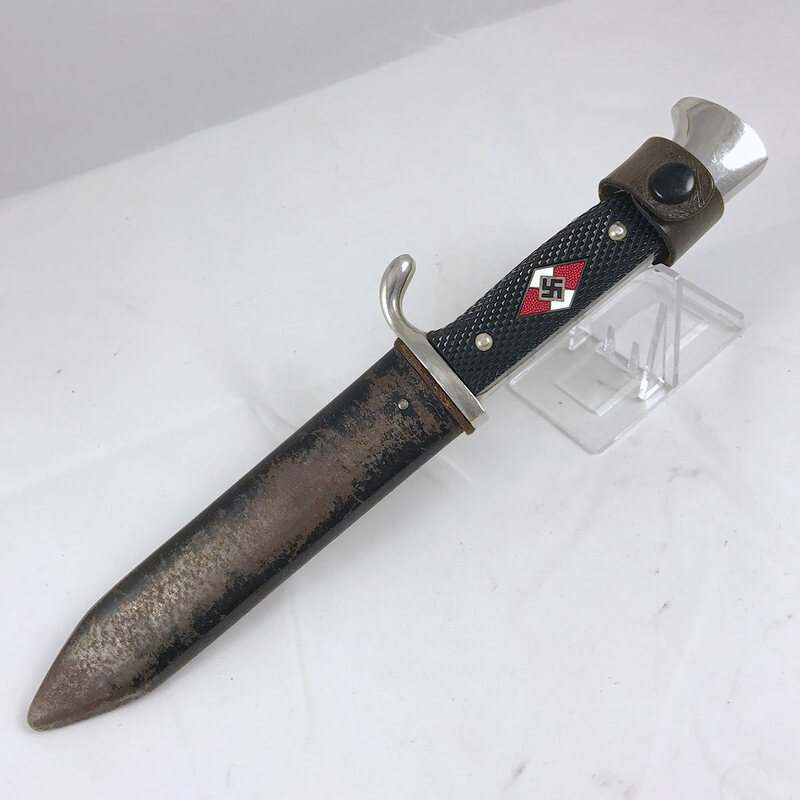 There is some oxidation spotting, but when taking about a Böker SS dagger you take what you can get when they come up for sale since they never last long in any condition! 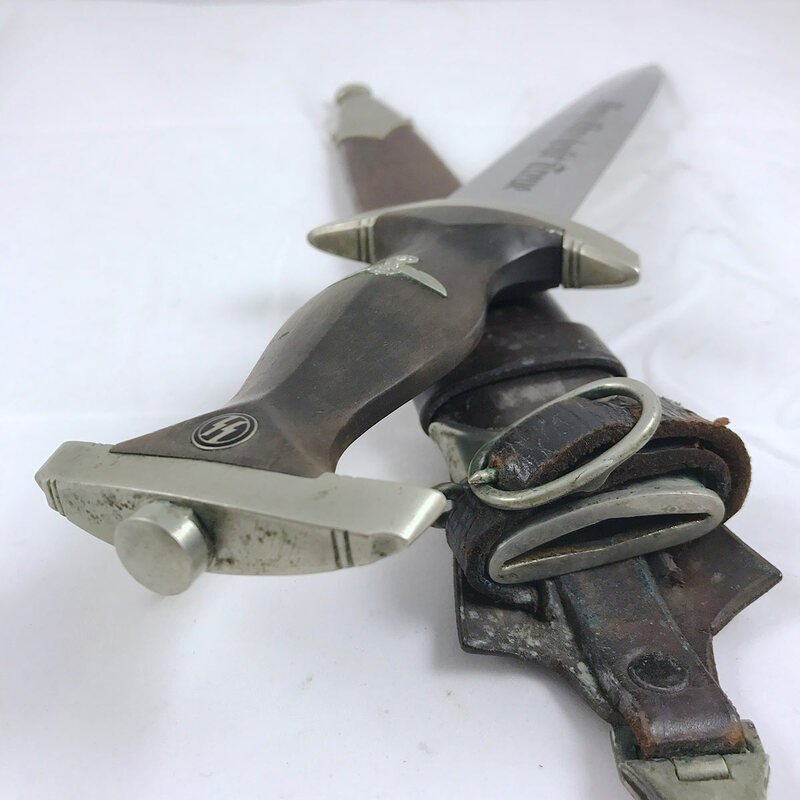 The motto and Boker maker’s mark both share the same deep gray tone, which is consistent across all letters of the motto. 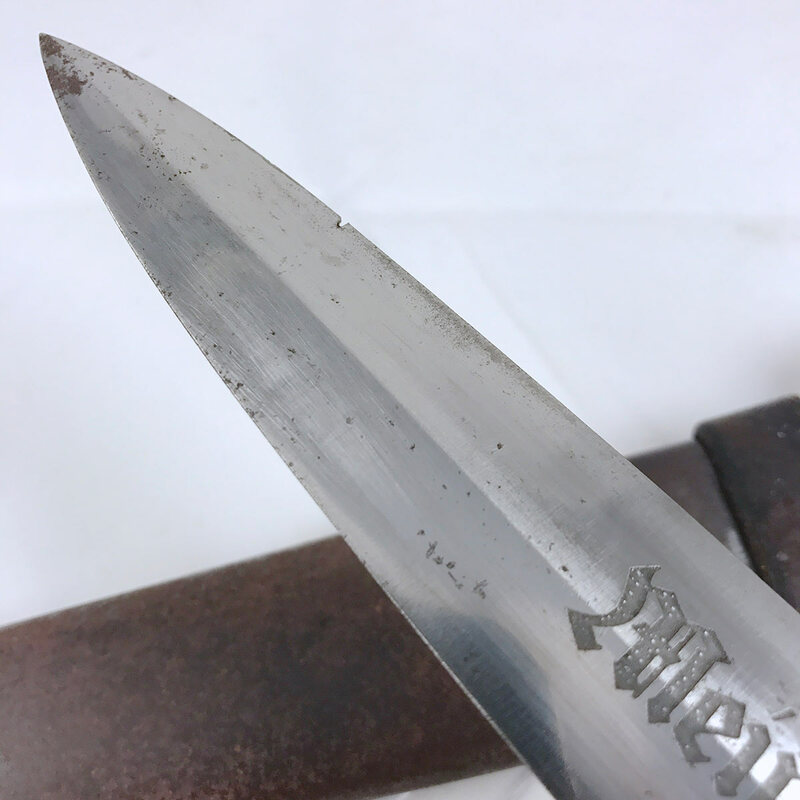 Aside from the oxidation spotting the only other flaw with this blade is a very small nick a couple of inches from the tip (see the photo). 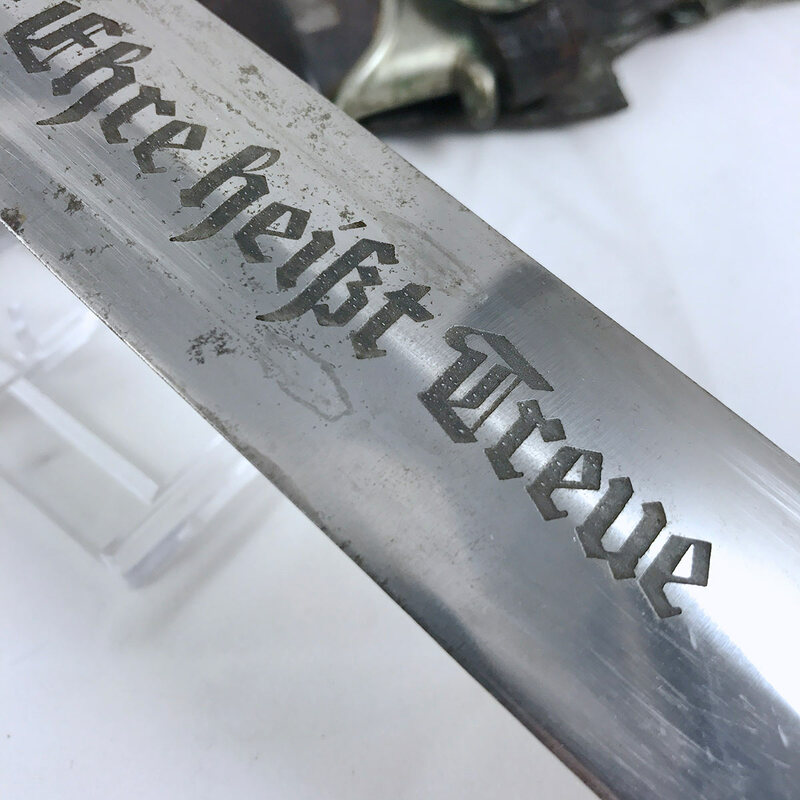 There are services out there that can repair these little nicks, but personally we’d recommend leaving it as-is since this is how the dagger was found. 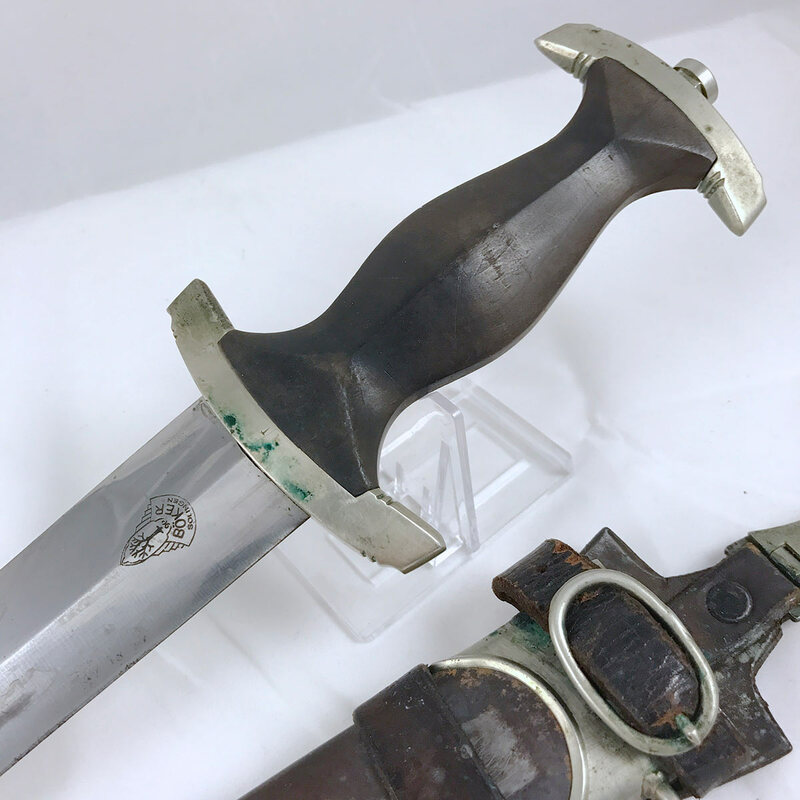 The anodized scabbard is in average condition, with surface oxidation typical of these scabbards, but no dings or dents to the body or the nickel fittings. 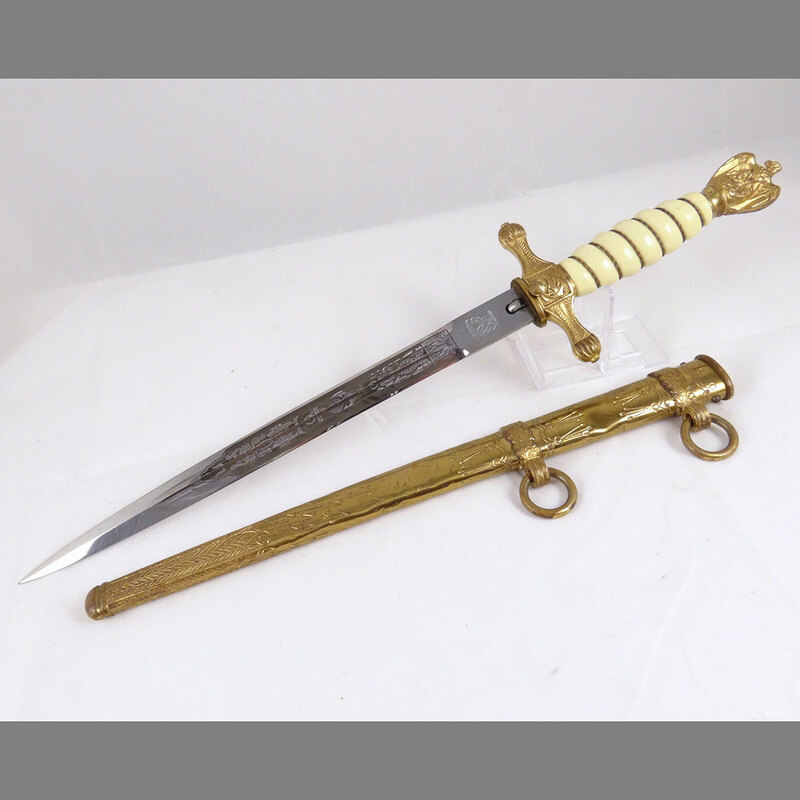 The tip and throat fittings shows a patina perfectly matching the guards. The screws are nice any tight with no signs of tampering. 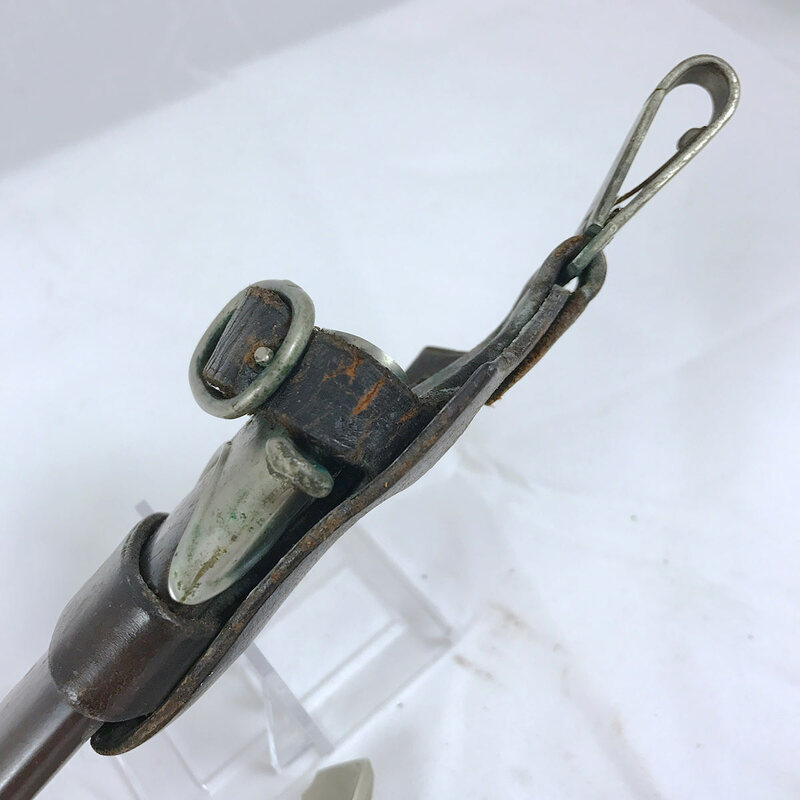 Like the reverse of the lower grip guard, there is strong verdigris buildup on the surface of the throat fitting beneath the vertical hanger where the leather touched the nickel for several decades. One final note about the scabbard is the missing hanger ring. We see this from time-to-time where there is a vertical hander with the dagger. 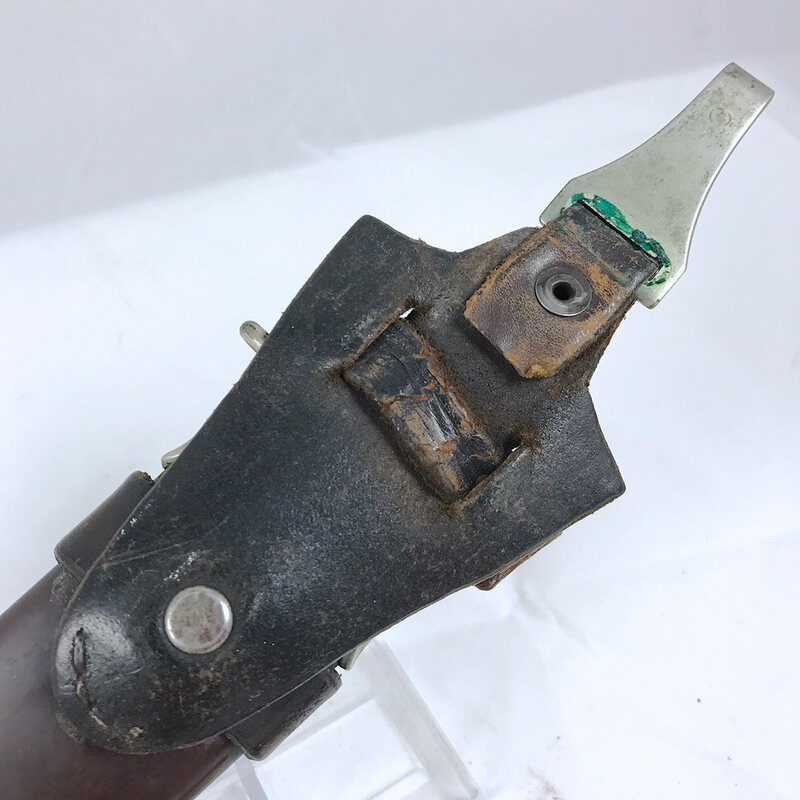 Some SS men would remove the ring because it was simpler to attach the topmost leather strap of the vertical hanger. 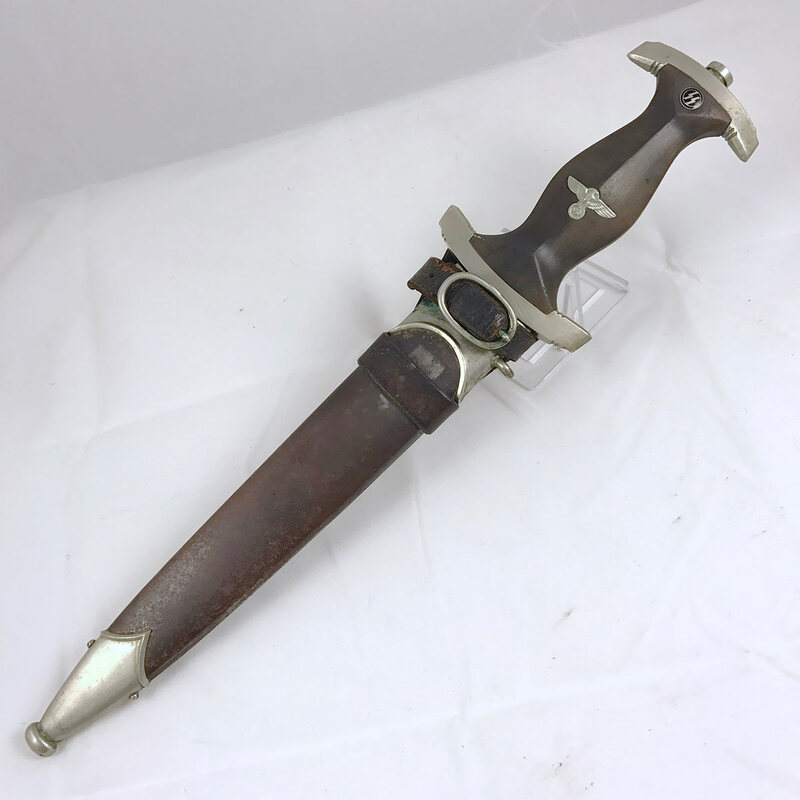 This, along with the verdigris buildup, are very good qualities to see as they let us know that the vertical hanger was not added to this dagger, but has been with this dagger for many, many years. 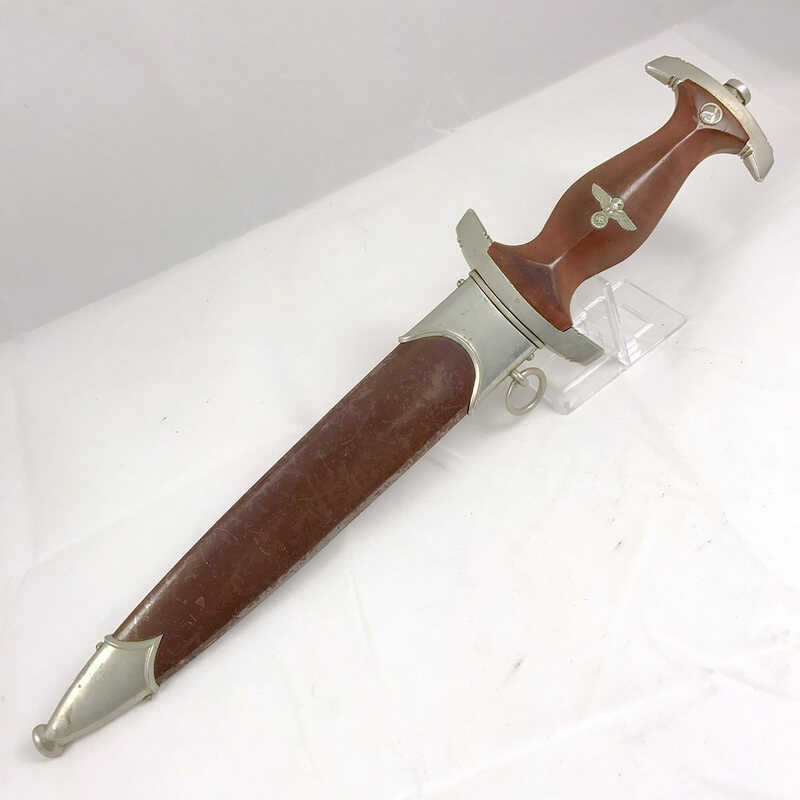 Last, but not least, we have a nice early vertical hanger with this dagger that, as mentioned above, is original to it based on all the evidence we see. 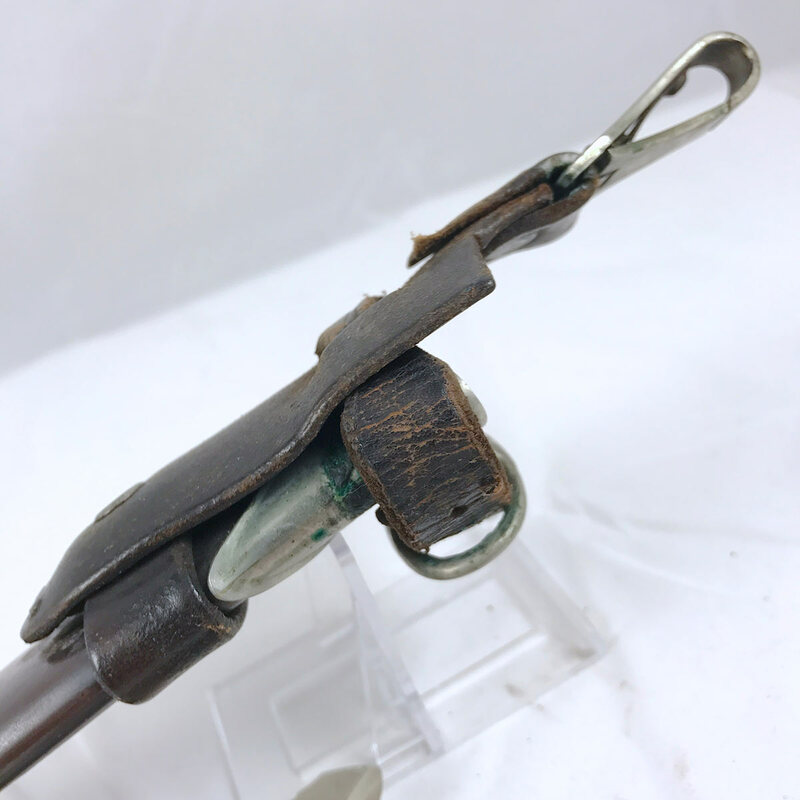 Note how the triangular body of the hanger on the reverse of the scabbard has contoured around the straps from years of use. 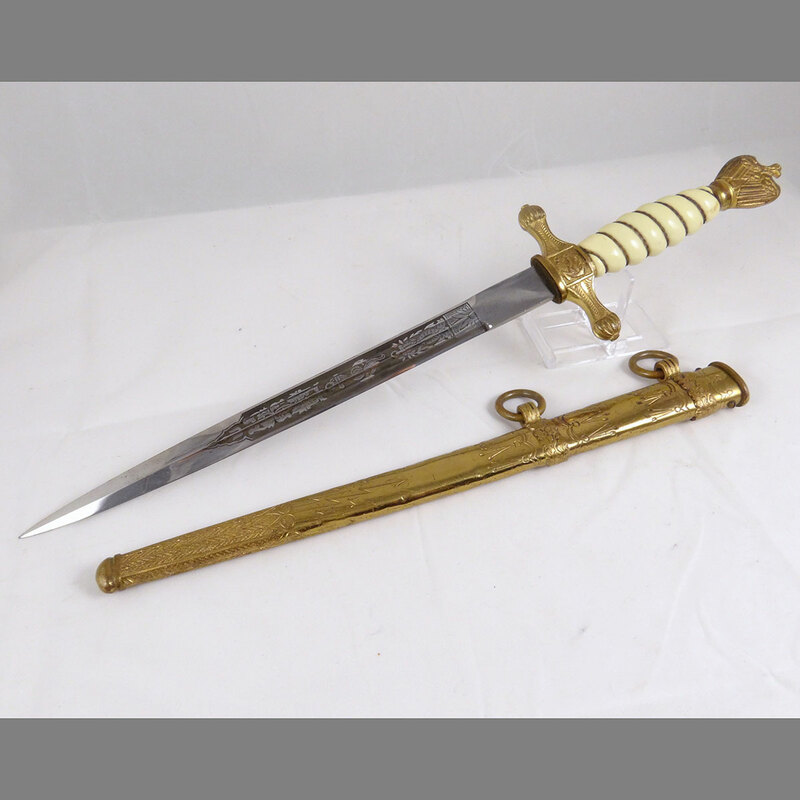 If only this dagger could talk, the stories it would tell! 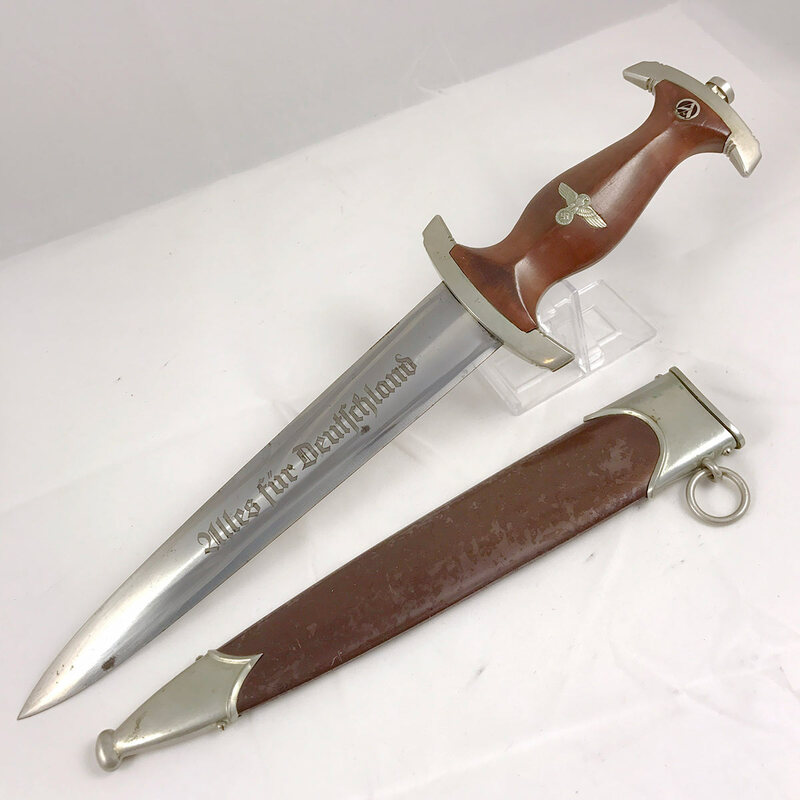 If you’ve been in the market for a Böker SS dagger, or a nice original, uncleaned and untouched SS dagger, this is your chance. They don’t get much better when considering the originality of this example.